The NEW seven-song disc combines Dave’s celebrated songwriting with Kristi’s great harmonies, creating an easy, charming, and inspiring experience for the listener. Some of Ann Arbor’s favorite musicians are featured in the collection, including horn player Ross Huff of the Macpodz, bassist John Sperendi and keyboardist Neil Donato of the Flying Latini Brothers, guitarist Dave Keeney of Hoodang, and nationally recognized saxophonist Mark Maxwell. 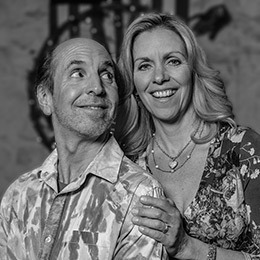 Dave & Kristi have found the magic that happens when two voices share a melody. Kristi’s natural gift for harmony is instantly bringing new life to Dave’s songs. Close, comforting, and warm, Kristi’s voice slips in right beside Dave’s, creating an absolutely beautiful effect. Plus her charming and confident stage presence, along with her quick wit, are adding a whole new appeal to Dave’s shows. Together they have performed at music festivals, listening rooms, and brewpubs from the Porcupine Mountains in Michigan’s Upper Peninsula all the way down to Oberlin, Ohio. Before teaming up with Dave, Kristi Lynn Davis logged in about 1,200 performances and 240,000 kicks as a Radio City Rockette. She also sailed the globe as a singer-dancer on luxurious cruise ships and worked in musical theatre productions with showbiz icons Susan Anton, Buddy Ebsen, Maurice Hines, Jack Jones, Paige O’Hara, Juliet Prowse, Rip Taylor, and others. Kristi’s had so many adventures in show business, she had to write a book to keep them all straight. 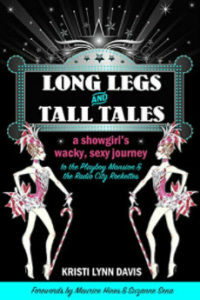 Her award-winning comic memoir is titled Long Legs and Tall Tales, and folks of all ages are loving it.